John Mallett is the Director of Operations at Bell’s Brewery. John has just released his new book Malt: A Practical Guide from Field to Brewhouse (Amazon affiliate link) which is the last in the four part brewing element series. Thank you to our sponsor Craft Beer and Brewing Magazine who is still offering a 20% discount with your subscription when you use the offer code beersmith when you purchase. Also thanks to the AHA – they are running a Gift Membership promotion from now until 31 December 2014, which includes a free book or video along with your membership card you can use for yourself or give it to a fellow brewer. 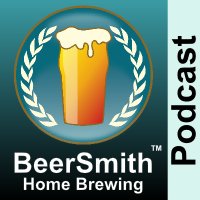 Also check out the new DVDs John Palmer and I filmed – How to Brew with Malt Extract and How to Brew All Grain are both available now and you can also find my BeerSmith software on CD or BeerSmith Mobile which great gifts for the holiday or New Year! We start by discussing some of the new projects at Bell’s Brewery which is a very popular craft brewery. John tells us about finishing up his new book on Malt – which was released just a few days before we recorded this episode. John shares his closing thoughts on malt! Thanks to John Mallett for appearing on the show and also to you for listening!